Tijuana Residents Grow Irritated By Influx Of Central American Migrants In Tijuana, thousands of migrants are waiting for their turn for an interview with U.S. immigration officials. Most are camped out in a squalid sports complex that's been turned into a shelter. Central American migrants wait in line in hopes of receiving donated food and hygiene supplies, outside of a sports complex serving as a shelter for more than 5,000 Central American migrants, in Tijuana, Mexico. 49-year-old Blanca Isabel Robledo knows what it's like to be a migrant. Fourteen years ago she and her family moved from Mexico's southern border in Chiapas up to Tijuana, which hugs its northern border. But she's had it with the recently arrived Central Americans, some of whom tried to breach the U.S. border on Sunday. "I don't want them to stay," she says in Spanish, "because they're rebellious, they're people who've only come to create conflict." That sentiment is shared by another Tijuana resident, 48-year-old Lucia Barrio who says it is better to send them back to where they came from, "because they brought children with them, and those children are suffering." Barroso lives next to the big sports arena along the U.S. border that's become a squalid campground for nearly six thousand migrants. Parents in the neighborhood are so disturbed by these newcomers that they locked up and shut down a nearby elementary school yesterday. 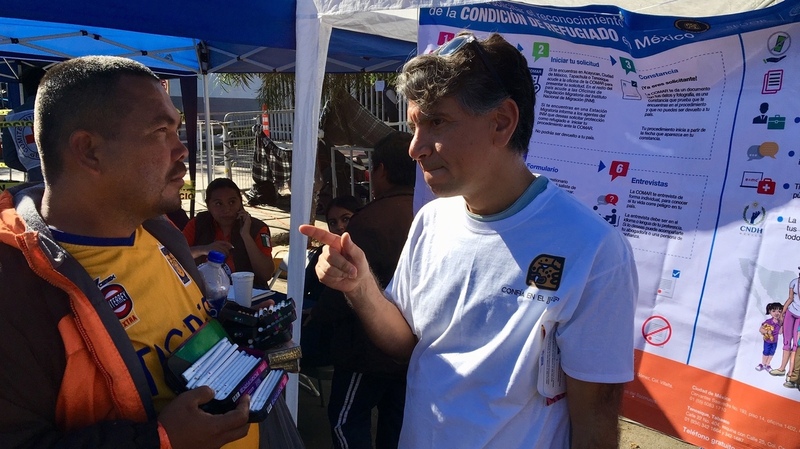 Jorge Bustamante of the UN High Commission for Refugees explains to a migrant the process for applying for asylum in Mexico. Some of the migrants who have agreed to return to their home countries were loading onto a van for a free ride home. 30-year-old Almegadalfo Gutierrez Rodriguez from Honduras was one of them. He says he he figures the best thing is to go home. He tried breaking into the U.S. on Sunday with hundreds of other migrants, some of them small children, but U.S. Border Patrol agents turned them away, firing tear gas into Mexico. Mexico has offered to consider asylum claims. Francesca Fontanini, a spokesperson for the U.N. High Commission for Refugees, says Sunday's commotion seems to have piqued interest among the migrants in taking up Mexico's offer. "Yesterday we observed the increase, an increase of asylum requests," she said. "About 47 asylum claims has been submitted to the COMAR, the Mexican Commission for Refugee Aid, when last week the average was between 15-20 per day. " 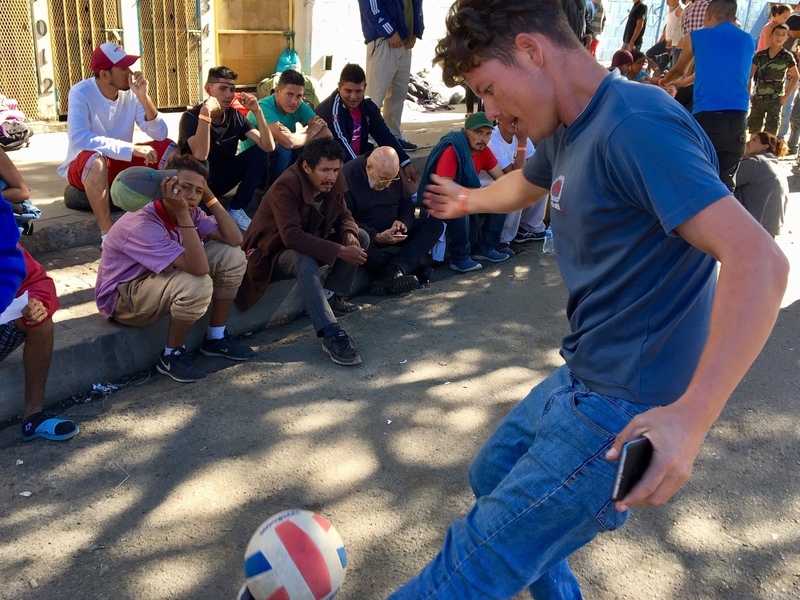 Street soccer - and watching it - passes the long days of waiting for migrants. "No nos queda otro caminos que ser peregrinos y buscar destino en otro lugar," the band sang. "We have no option other than to be pilgrims and look for destiny in another place." A Honduran woman named Mirna Contreras sought to explain that the border melee on Sunday has had a big impact on the migrants' morale. "We were like sheep without a shepherd at the border," she says, "but we never started the violence. The violence came from the other side, from those who teargassed us." Still, Tijuana municipal delegate Genaro Lopez says his city's been shaken. "We're not scared of migrants," he said. "We're scared of big, migrant caravans getting illegally into our country, ending all the way up here. We don't understand why they are here." 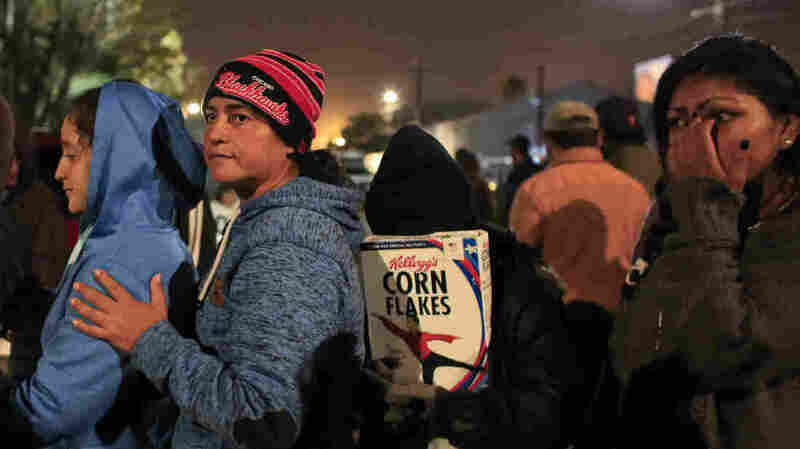 He admitted that feeding the migrants and giving them shelter may encourage others to come to Tijuana, but said it would be worse to have them roaming the streets. The two meals a day the migrants have been getting will be reduced to one next week, he adds, unless a new Mexican government taking office Saturday comes through with more help.